"These cupcakes are brilliantly colored all the way through. No food coloring is used here. The color comes from pureeing freshly roasted beets. I tested the recipe with canned beets and the color was drab and faded. But roasting beets is easy, and you can measure and prepare the rest of the ingredients for the cupcakes and buttercream while they roast. I finely chop the roasted beets and then puree them in a food processor. Let the machine run for a couple of minutes until the puree is completely smooth." To make the cupcakes, position a rack in the center of the oven and preheat to 350°F. Line a 12-cup standard muffin pan with paper liners. Sift together the flour, baking powder, salt, and cinnamon. Set aside. In a large bowl, stir together the beet puree, granulated sugar, eggs, canola oil, and vanilla. Using a rubber spatula, stir in one-third of the flour mixture, continuing to stir just until the flour disappears. Do not beat or over-mix. Repeat, adding the remaining four mixture in two batches. Spoon the batter into the prepared muffin cups, dividing the batter evenly and filling each cup almost to the top of the liner. 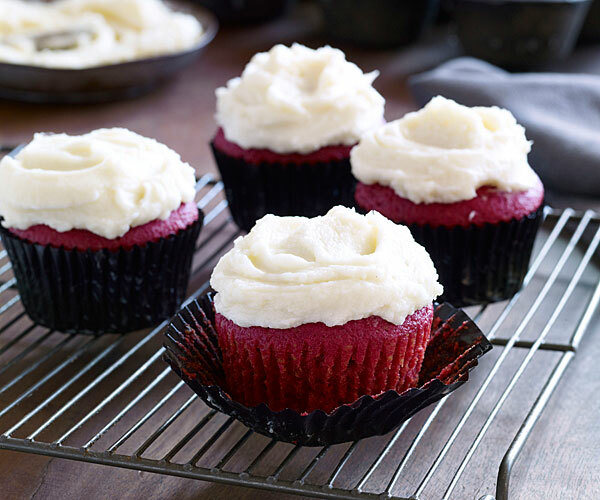 Bake until a toothpick inserted into the center of a cupcake comes out clean, 25-30 minutes. Let the cupcakes cool in the pan on a wire rack for 10 minutes. Then carefully release the cupcakes from the pan and let cool completely on the rack, about 1 hour. To make the buttercream, in the bowl of a stand mixer fitted with the paddle attachment, or in a medium bowl using a handheld mixer, cream the butter on low speed until creamy and smooth. Add the confectioners' sugar, cream, orange oil, and vanilla and beat on low speed until incorporated, about 2 minutes. Add the orange juice, a little at a time, until the buttercream is fluffy and smooth. Spread a thick layer of buttercream on the top of each cooled cupcake, swirling it to create a decorative finish. The cupcakes can be made in advance; cover and store at room temperature for up to 2 days or freeze for up to 1 month. Cook's Note: Pure orange oil is an essential oil that is cold pressed from the rind of oranges. Do not confuse it with pure orange extract, which is alcohol flavored with orange oil. Look for pure orange oil in the baking section of natural food stores, at baking supply stores, or in Middle Eastern grocery stores.